Home remedies for mange: Mange is a skin disease common in animals which is triggered by microscopic parasitic mites. Mainly characterized by hair loss, severe itching, scabs, and abrasions, this condition is known as Sarcoptic mange or canine scabies in dogs. There are two major types of mange that are typically seen in dogs- Sarcoptic and Demodectic. To see if your dog suffers from either, watch out for scaly bald patches on your dog. 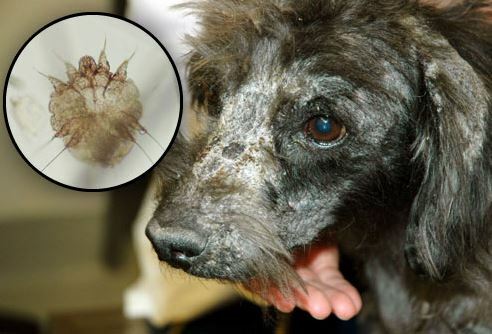 The symptoms of mange depend on the kind of mites that are affecting your pet. Demodectic mange causes bald spots, sores, hair loss and scabs while the bacterial infections associated with disease make it all the more uncomfortable. Sarcoptic mange, on the other hand, causes intense itching which may result in restlessness as well as anxiety. It causes hair loss, sores, and skin redness. The common target areas of mange in dogs are the face, legs, elbow, and ear. Having said that, it does spread rapidly to other parts of the body. While demodectic mange cannot be transmitted to human beings, sarcoptic mange can, causing red bumps on the skin, analogous to that of a mosquito bite. Before proceeding to the home remedies of mange, it is crucial that you take a look at its symptoms. The formation of pustules followed by discharge. Scabs in the affected areas. The good news is that mange can be treated and prevented at the comfort of your very home. Here are some home remedies for mange to help you and your furry friend out! A combination of hydrogen peroxide and borax happens to be one of the most effective disinfectants there is out there for your dog. Hydrogen peroxide, as a natural disinfectant acts like a cleanser, creating an environment wherein mites cannot survive. Borax, on the other hand, is effective in killing fungi as well as insects. To this, add three heaping tablespoons of borax. Ensure that your pet soaks in this solution for several hours, so much so, that you don’t need to rinse off with water. Make sure to put on its cone collar, because you do not want it to be licking the solution. Repeat this daily for two or three days. Make sure you use this remedy once every day for two or three days. You could also use this solution to wash the bedding, toys and any other article that your dog might possess in this solution. Be mindful of the fact that ingesting borax can make your dog sick, so keep it out of its reach at all times, because you know how pesky your dog really is! Raw, unfiltered apple cider vinegar makes one of the best home remedies for mange and can be topically leveraged to treat and control a mange infection. The reason why this remedy works is because it has antiseptic and antimicrobial properties that can effectively nip the problem right in the bud. When using this remedy, ensure that you always use diluted apple cider vinegar, because ACV in its original form can sting. Mix in a cup of apple cider vinegar and water. Spray your dog’s fur with this solution while combing it at intervals. Ensure that the quantity used suffices to penetrate all the way to the skin. Follow this remedy twice or thrice a week depending on the severity of the mange. Mix in half a cup of apple cider vinegar, borax and warm water in a bucket. Dip a sponge into the solution, rubbing it all over your dog. Follow this remedy twice or thrice a week. Add raw, unfiltered ACV to your dog’s food once every day for a week. Neem has dermatological benefits that humans, as well as pets, can reap! This is mainly due to the antiseptic nature of neem which will not only treat mange, but also keep the infection at bay. It also nourishes and soothes the surface of the skin, ensuring faster regrowth of fur. You could purchase an over the counter organic neem shampoo and bathe your dog with this every week. You could also mix in equal parts of pure neem oil and coconut oil, applying this to the affected areas twice or thrice a day. Alternatively, boil a handful of neem leaves in a pan of water for about ten minutes, allowing it to cool- straining soon after. Spray this onto your dog’s fur and leave it on- repeating once every day. Honey is a natural product which helps to relieve any discomfort that your pet might be experiencing. It is a powerful antioxidant which makes it difficult for the mites to survive for a very long time on the skin. Also, it aids in providing relief from the itchiness. With its antiseptic properties, it heals the surface of the skin preventing an infection. Compared to the other home remedies for mange, this is by far the easiest. Apply honey directly onto the affected skin- locally harvested honey is preferred. Let this sit for a few hours. Wipe off the excess water in order to prevent your dog’s skin from attracting any ants. Repeat this twice every day. Related: How to get rid of horse flies? Any kind of vegetable oil makes for an ideal home remedy for mange. This is due to the stickiness associated with the vegetable oil that cuts off the air supply of the mites, killing them eventually. Run this sponge along the fur of your dog. Related: How to get rid of skunk smell from your pet? We hope these mild home remedies for mange will come in handy for your fur buddy. Mange can be treated right in your home with such simple ingredients, so do not hesitate to try them out! Be sure to take your dog to the vet if symptoms persist.